Yesterday I touched on various possibilities on how to shoot your pictures (RAW or JPEG), but from there, it went into such things as separating your RAW's from your JPEG's, backing up your RAW's to a safe place, making new kinds of pictures from old ones - all of which bring up the question, "How would I manage all this stuff?" Most photographers each find their own way of keeping track of all their files; I'd like to offer some tips to beginners who may not know the best way to start, and especially to those for whom a first Digital Camera purchase also means a first computer purchase, or maybe "getting over your head" in the family PC, beyond using Email and Facebook. Please don't feel insulted, embarrassed or ashamed that I'm speaking at this level - if you already know this stuff, all the better, but believe me, I've known dozens of Managers in an IT Company who really had no idea how to manage computer files - they're the ones you see with dozens of icons plastered all over their desktops. It's not that such folks are stupid. It's because Microsoft Windows never made it easy. I think that in the course of this post, you'll see why, and at the same time, learn how. I use Linux, not Windows, although I have both on my computer. 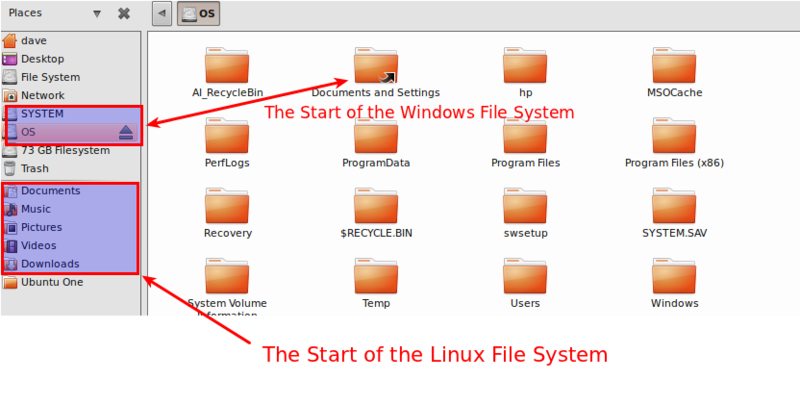 When you have both, Linux is able to fully integrate with the Windows Filing System, but not the other way around - Windows cannot see or do anything with Linux. 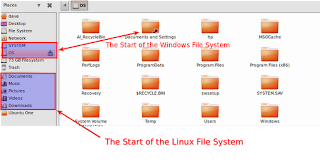 Therefore, I store all of my files in the Windows System using Linux to do it, even though the Linux Filing System is far more simple and intuitive, as we shall see. I do this simply so I can get at my files using both systems. The Screenshots I'm about to show are Linux, but it doesn't matter, because it's the Windows 7 Filing System that I'm demonstrating. I'm just using Linux as the "viewer" into the Windows world. I'm doing it this way for two reasons; 1) Linux has a free Screenshot editing program, Windows doesn't, and 2) I also want to show you how much simpler Linux is to use than Windows (that's right!) for your personal consideration. So let's get started. Every new Camera comes with some kind of "Photo Management" software, to "help you organize your pictures". Don't bother with it - I'm going to show you a better way, and even if you choose to use the software that came with your camera, you should do what I'm going to show you before you even install that software anyway. 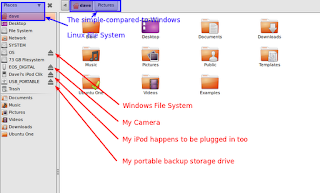 I am going to show you how to organize your pictures in a system of folders directly in your Windows File System. "Documents and Settings" contains more than just "documents" - it also contains all your music, downloads, and PICTURES. Also, it does not contain any "settings" that you can actually do anything about, and even if it did, who cares! A bit of an explanation here - my computer auto-installed Windows 7 when I first turned it on, like most new machines do these days. When it did so, it divided the whole Windows installation into two entities named "System" and "OS". Now "OS" is called "Operating System", but that's not where the operating system is installed; it is put into the area labelled "System", and the "Documents and Settings" are put into the one labelled OS!!! Once you figure this out, if you ever really do, then your well on your way. Welcome to the world of Bill Gates! The above screenshot also shows how Linux gets it right - it all starts in a simple list of "Documents", Music", "Pictures", "Videos" and "Downloads". In Linux, there's absolutely nothing else that matters - you simply click on one of these 5 main categories and start filing. But I am assuming that most readers are not using Linux (shame, shame...) so the rest of this tutorial will show you the Windows way. The overall path in Windows is at the top. As you can see, under "Documents and Settings" there's another folder called "Dave" and under that, I finally find my Documents, Downloads, Music, Videos and Pictures. Under pictures, I have everything set up in a bunch of Folders labelled by "YEAR Topic" - in this case you see "2012 Sackville". Others are '2012 BW, 2012 Art, 2012 People, 2012 Creatures, 2012 Places, etc. and for other years I've got 2009 Cars... 2010 Places... 2011 Creatures... and what have you. I try to keep it fairly consistent. Optionally, under each of these YEAR Topic Folders, if I take a lot of pictures under that particular topic, I create monthly folders 01 Jan, 02 Feb... 06 Jun as you can see here. And that's pretty much it - all my photos are filed by YEAR Topic > Month. I should also note that for my RAW files, I have "YEAR RAW > Month" the same way, and as I mentioned yesterday, I make sure these get backed up to another drive. The left pane is my Windows (showing some of my YEAR Topic Folders to give you the idea), and the right pane is my Camera Memory Card. I simply select groups of photos (using "Ctrl - Click" method), then Drag 'n' Drop the photos into the appropriate Folders. Any photo on the Camera labelled as a *.CR2 is a RAW file, so I make sure I drag them into the RAW Folder, thus separating them from the JPEG's. 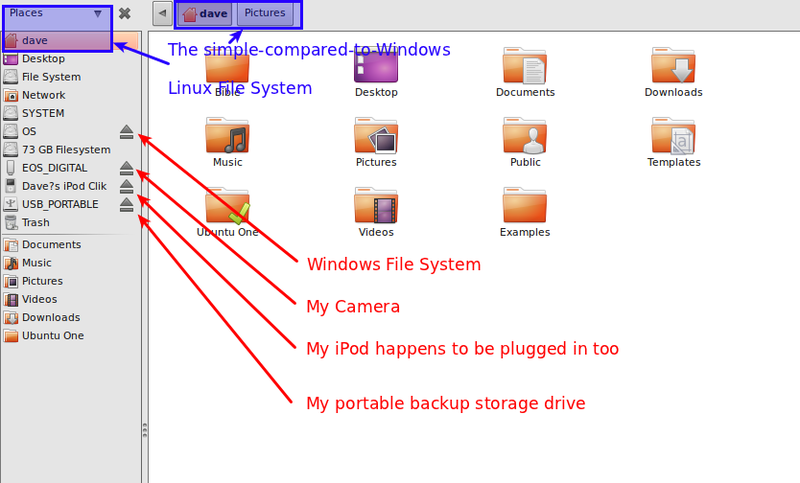 So there - I've taught you a little bit about how to organize your photos into Folders without using the software that comes with your camera, I've taught you how stupid Windows really is, and I've demonstrated the superior qualities of Linux all in one Tutorial. I hope you found it fun. Tomorrows topic will be a continuation of this one - How to Organize Your Pictures Online.